Update May 29, 2012: the list is removed due to the upkeep of maintaining legacy content of this type. Sorry for the inconvenience – Christian Holst. At Baymard Institute we have a long list of blogs, newsletters and articles databases we read for information and insights on usability and conversion rate optimization. While all of them are good, a few are truly great. As a service to you we’ve a made “a list of the best resources”. Unlike many others, our aim isn’t to provide the longest list but rather a curated list of carefully selected resources. The top resources, the sites that you must read if you’re serious about usability and conversion rate optimization. 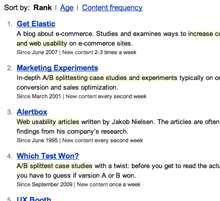 The top resources on usability and conversion rate optimization. The requirement for getting on the list is simple: sites that have made a vital contribution to the e-commerce usability and optimization community and continue to do so. There’s currently 11 sites on the list but we’ll be adding and removing sites to keep the list updated. For your convenience the list is sortable by rank, date founded and posting frequency. Go here to see the list: “Top 11 E-commerce Usability and Optimization Resources”. Maybe you’ll find new and inspiring sources to follow. Authored by Baymard Institute. Published on September 12, 2010.